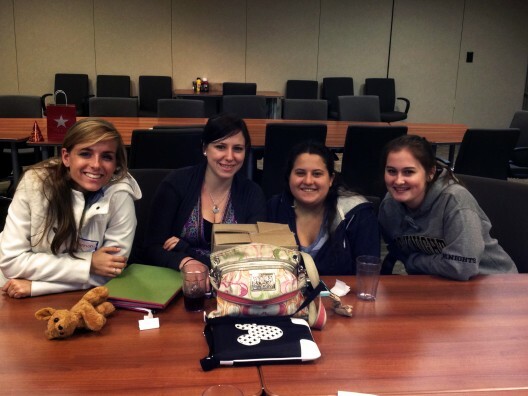 Shannon Hassett (left) and some other members of the Type 1 Diabetes support group at UCF. College is all about finding out who you are. It’s a time to live out teenage shenanigans, solidify your career, and step into the adult world. It’s about finding your passions, learning how to leave your mark on society, and better our communities. But for a Type 1 diabetic student, it’s also about survival. I was diagnosed with Type 1 when I was 11 years old, and have been rocking my insulin pump since I was 13. November is Type 1 Diabetes Awareness Month, but even with our world of social media and instant news updates, it shocks me how little the general population knows about this condition that 3 million Americans are currently living with. Type 1 Diabetes Mellitus is an autoimmune disease that attacks the pancreas, specifically the beta cells that produce insulin. Insulin is a hormone that controls the level of sugar in the blood and allows our bodies to use the energy consumed in food. Without insulin, your body has no access to energy, causing blood sugar to rise to critical levels (ketoacidosis), and eventually cause organ damage, then failure, and eventually death. Since a Type 1 diabetic’s insulin producing cells are killed off, it is vital for us to administer insulin via an insulin pump, injections, or with insulin pens. To know when we need these injections, we have to monitor our blood sugars by pricking our fingers and testing the glucose levels in the blood 4 to 10 or more times a day in order to ensure that the levels stay within a healthy range. I am currently a junior in UCF’s nursing program, and I know firsthand how important it is to maintain a chronic disease. I also know how ridiculously exhausting and irritating it can be. After a while, many people just “burn out” dealing with the disease. It’s a 24/7, 365-day-a-year responsibility, and we get no vacation time from it. The Type 1 support group at UCF is my family away from home. Being part of the group has reignited my passion for taking care of myself so that I can help others, and has solidified my decision to become a diabetes primary healthcare provider. Being able to share my experiences with a group of friends who understand diabetes and the challenges we face is incredibly therapeutic. So how do we manage a college schedule on top of managing diabetes? The same way anyone else does. We wake up, go to class, do homework, exercise, go to work, and hang out with friends. Sure, we have to be careful not to eat therapeutic, sinfully large bowls of ice cream when dealing with breakups or exams – but we definitely do eat ice cream! And careful, limited drinking with friends isn’t out of the question (if we aren’t the designated driver, of course). And when our blood sugars are low, you bet we’ll devour those Skittles. Or Smarties. Or whatever candy happens to be nearby. Our motto: Never waste a good low! Don’t mistake my light-hearted tone for disregard, though. If we get careless, or sick, or somehow don’t have the medical supplies or food we need, things can get serious really fast. An untreated low blood sugar can cause us to fall unconscious, at which point we have roughly 2 minutes before the brain shuts down because it has no fuel to run on. Sicknesses or infections can wreak havoc on blood sugars and we often don’t heal as well or as quickly. This past year, we were devastated to lose a member of our Type 1 group at UCF due to the effects of a prolonged infection and diabetes. Lauren Bonn was one of the brightest, funniest, and warmest people any of us had ever met, and she was taken from us too soon. Who knows whether she would have survived her infection if she had not been diabetic? Diabetes may not have been the entire reason she passed away, but it was definitely a contributing factor. She will forever be missed. While we still mourn her passing, we are even more motivated to further diabetes research and awareness. It would be comforting to know that if a diabetic were to pass out from a low, that anyone could recognize a medical bracelet or insulin pump and know how to give proper emergency treatment and save a life. It would be nice, even, for people to understand that having Type 1 diabetes doesn’t mean that you’re old and overweight. Most of all, I dream of a world where we don’t have to worry about losing another friend to it – a world without diabetes. It all begins with awareness. If you have a diabetic friend, get to know their high- and low-blood-sugar symptoms, and how to help them if they need it. Perhaps the best thing you can do for a diabetic friend is be what we call a Type 3 diabetic – someone without diabetes who loves and supports a diabetic. Or offer financial support to organizations funding diabetes research such as Juvenile Diabetes Research Foundation. We have high hopes for research and medical advancements to take us from Type 1 to type none! This is an excellent article! Thanks so much for sharing y0ur insights from an insiders point of view! Beautifully written article. Keep up your hopes. There will be a cure and Lauren would not want you to give up your fight!